It's summertime. I have finished my last magazine. The renthouse is just about polished up and I am back in the art mode! 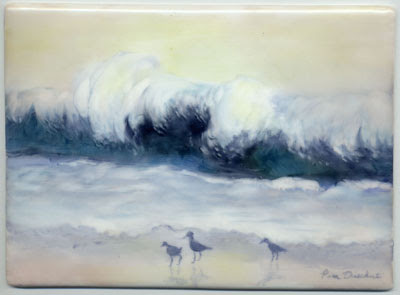 Here is a little 5 x 7 tile of the ocean. I have happy childhood memories of the beach and happy memories from going with my kids almost every summer of their lives and now the grandkids. I think I need to darken the birds. I hope they get out of the way of those big waves.